Race Officer Cathy Wilson, ably assisted by Terry Scarth and Baden Buckle scoring. The fourth KMBC Yacht race of the year saw a warm sunny day with light winds and very little cloud. Enough wind to run all three laps on a slightly shortened Course. The winds light with occasional gusts, typical Wilton Park. The race was started on time at 10.30 with sixteen yachts taking part. The usual mix of yachts for this event, Jif785, Jif65, DF65, Northwind, Nekst, Nimbus, Infinity and a couple of one designs. 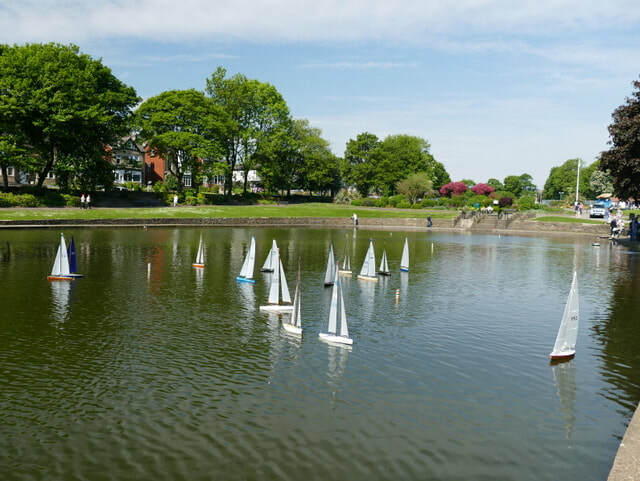 The light winds favoured the larger sailed yachts and John Goodyear and Dave Tuckwood were round the first mark in the lead. After the first lap John Goodyear had a good lead with Andy Nall an impressive second with a Jif. 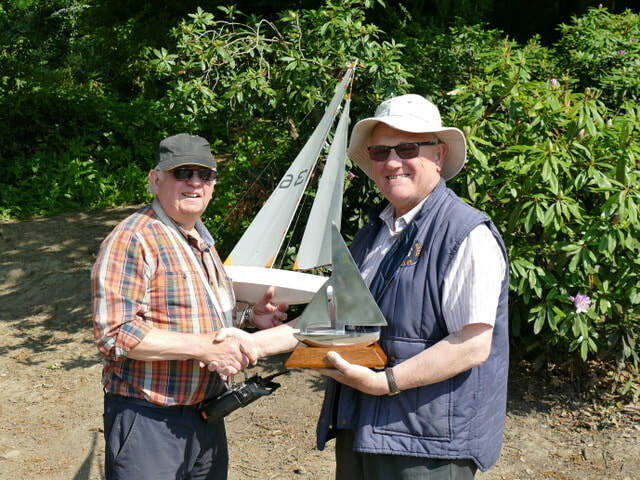 Fred Senior and Mick Hebden were third and fourth with a Northwind and a DF65 respectively, so a good mix of boats. John held on to the lead but was being caught by Dave Tuckwood over the last lap. John kept the lead and so kept the the Cup from last year. Only one DNF 137 Stuart Smith. The race was all over in 30 minutes so the scale guys could get back on the water fairly quickly. Results. 135 John Goodyear, 197 Dave Tuckwood, 138 Roy Clarkson, 146 Stuart Lockwood, 101 Fred Senior, 510 Mick Hebden, 711 Andy Nall, 145 David Lee, 132 Jack Stanley, 714 Richard Leech, 136 Doug Potter, 131 D Sykes, 712 Brian Byrne, 149 Dave Etchells, 148 Bill Crowther. DNF 137 Stuart Smith. Race Officer Cathy Wilson, ably assisted by Terry Scarth, Baden Buckle and Mick Burtop scoring. 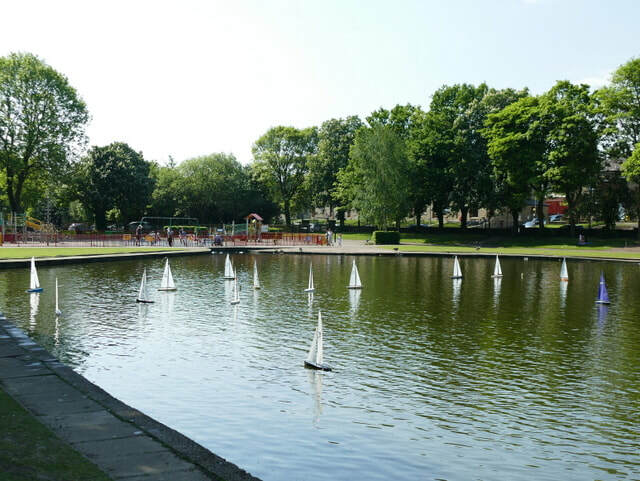 The new Margaret Wyatt Yacht race took place today. This is in honour of our Treasurer Margaret Wyatt who sadly passed away just over a year ago. This race replaces the Northwind Race and Trophy and is for RG65 class yachts only. 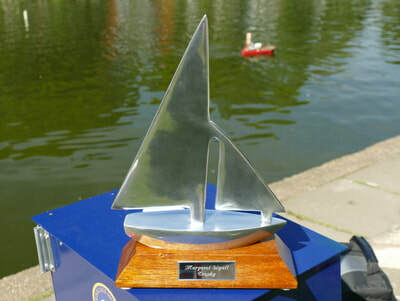 The third KMBC Yacht race of the year again saw a pleasant sunny day with temperatures in the low twenty degrees. Winds were light so the race was run on our shortest course over three laps. 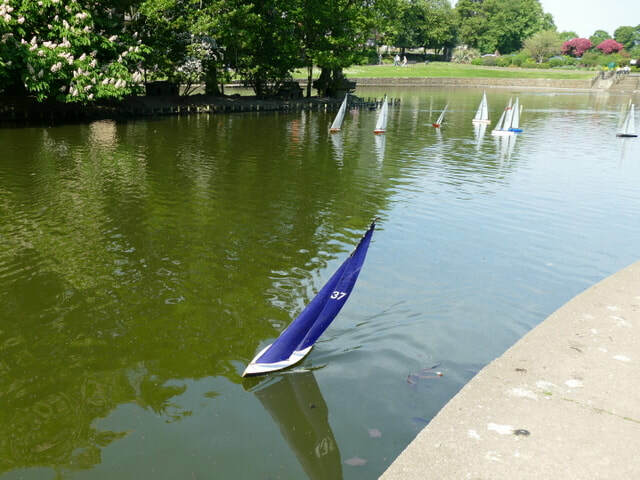 Winds were enough to keep yachts moving albeit in typical Wilton Park variable conditions. The race was started on time at 10.30 with fifteen yachts taking part. This race had a mix of RG65 , JIF65, DF65, Puma and One Design. The light winds favoured the JIF65 boats with David Lee the first of the DF65 boats. No A+ rigs for DF65 as this is a RG65 race. Stuart Smith had a good lead at the first Mark and maintained the lead before being overtaken at the last two marks, very close to the finish line, by Doug Potter. We all thought Stuart was going to win but as we all know Doug never gives up! The race was all over in 45 minutes and being on the short course there was no impact on the scale guys at all. Results. 136 Doug Potter, 137 Stuart Smith, 135 John Goodyear, 711 Andy Nall, 509 Andy Whitham, 510 Mick Hebden, 149 Dave Etchells, 197 Dave Tuckwood, 145 David Lee, 719 John Blackburn, 712 Brian Byrne, 714 Richard Leech, 181 Neil Stewart, 192 Harry Sharpe. DNF 148 Bill Crowther. Race Officer Cathy Wilson, ably assisted by Terry Scarth and Mick Burtop scoring. The second KMBC Yacht race of the year again saw a slightly cool day with light winds. Sunny with clouds and the wind enough to run all three laps on a slightly shortened Course.The winds light with occasional gusts, typical Wilton Park. The race was started on time at 10.30 with twelve yachts taking part. The usual mix of yachts for this event, Jif785, Jif65, DF65, Northwind, Nekst, Infinity and a couple of one designs. The light winds favoured the larger sailed yachts and Doug Potter and Dave Tuckwood were round the first mark in the lead. Stuart Smith and Roy Clarkson were not far behind. Doug and Dave swapped the lead throughout the race with Doug just taking honours on the finish line. The race was all over in 35 minutes so the scale guys could get back on all the water fairly quickly. A special mention to Roy Clarkson, first of the smaller Yachts over the line. 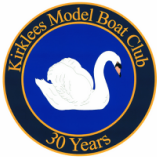 No DNFs so congratulations to all twelve skippers. Results. 136 Doug Potter, 197 Dave Tuckwood, 137 Stuart Smith, 138 Roy Clarkson, 518 Andrew Oconnor, 149 Dave Etchells, 132 Jack Stanley, 145 David Lee, 135 John Goodyear, 181 N Stewart, 712 Brian Byrne and 148 Bill Crowther. 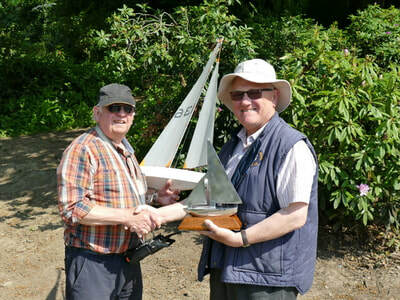 Harry Sharp (right) presents the March Hare Trophy to Dave Tuckwood. The first KMBC Yacht race of the year saw a slightly cool day with light winds. The winds were picking up and so the race was started with fourteen Yachts and sailing the full course of three laps duration. The usual mix of yachts for this event, Jif785, Jif65, DF65 Northwind, Nekst, Infinity and a couple of one designs. The light winds favoured the larger sailed yachts and Doug Potter, Cathy Wilson and Dave Tuckwoods boats all built up a good lead. A special mention to Andy Witham whose Jif65 kept the three leaders honest. Unfortunately the wind gradually dropped and the race took longer than anticipated so some scale modellers were unhappy the yachts kept them off the pond. Lessons to be learned for future races. Dave Tuckwood managed to take the lead on the last half lap of the race. Results. 197 Dave Tuckwood, 136 Doug Potter, 150 Cathy Wilson, 509 Andy Witham, 101, Fred Senior, 711 Andy Nall, 137 Stuart Smith, 145 David Lee, 149 Dave Etchells, 714 Richard Leech, 712 Brian Byrne. DNF 510 Mick Hebden, 192 Harry Sharpe, 148 Bill Crowther.